The Honor 6A is not necessarily a new device since it's been introduced in China back in May, but Europeans got the option to buy it only recently. Honor decided that its previously China-exclusive handset would make a fine addition to its portfolio of mid-range smartphones aimed at the European market. 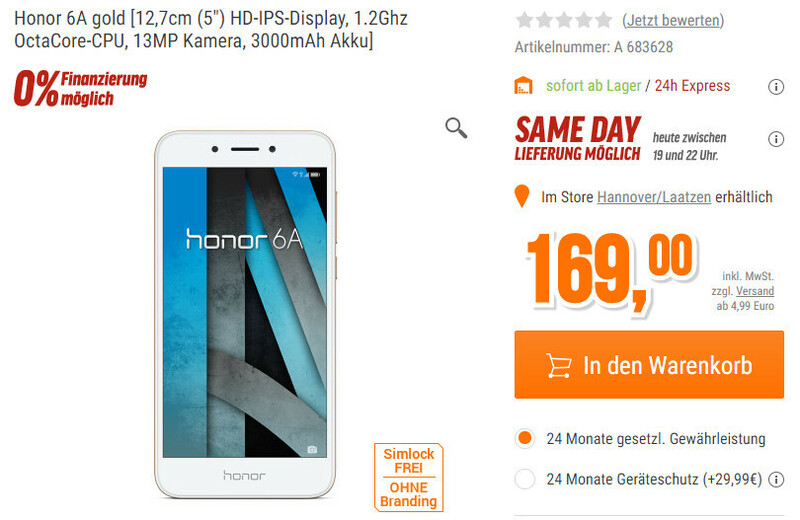 Starting this week, the Honor 6A will be available for purchase at various retailer across Europe for €169, a decent price considering its confirmed specs. The European version of Honor 6A is only slightly different than the Chinese variant when it comes to hardware. The smartphone sports the same 5-inch display with HD (720p) resolution and a 1.2GHz octa-core Qualcomm Snapdragon 430 processor, coupled with 2GB RAM and 16GB of expandable storage (up to 128GB via microSD). Honor 6A comes with a single-lens 13-megapixel camera on the back, as well as a secondary 5-megapixel camera on the front that should be enough to take average quality selfies. Although the Chinese variant features a rear-mounted fingerprint sensor, the European model lacks this component. On the flip side, the smartphone phone is powered by a massive 3,020 mAh battery. Also, Android 7.0 Nougat is on board along with EMUI 5.1 and dual-SIM support.